Over the last two weeks I’ve had some eye-opening experiences across the three dimensions of storytelling on which I’m focusing this summer. On storytelling via open mic, I’ve started a standup comedy workshop with the esteemed Leslie Wolff, and have audited a class by Judy Carter, a standup comedian who, ironically, is focused on bringing comedy into the business world. Lesley and Judy have very different approaches to standup: whereas Lesley encourages her students to talk about themselves and do so via story, Judy says, “nobody cares about you” and encourages her students to keep their material about their audience, and structured in a way that is more focused on a punchline. Either way, the more I workshop standup with my classmates, and attend comedy nights around LA, the more I realize that standup is special in that it’s one of the few areas of successful, popular entertainment that is not technology-driven. Standup is still (mostly) one girl or guy with a mic, a stage, and an audience. 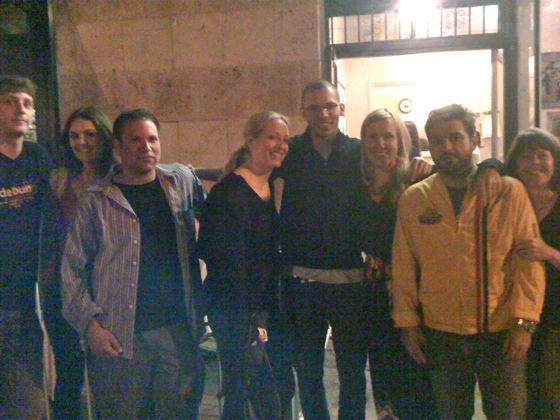 On storytelling via improv, I performed at the Upright Citizens Brigade theater with my colleagues from my 101 class at UCB. Given that everything we performed was made up on the spot, it was amazing to see how everyone’s nerves melted away while we found our groove as a group. On my own performance, while one of my skits landed well, some others did not and I feel that I’m still being too cerebral when it comes to how I enter a scene. I need to really let go a la “jump and the net will find you.” Some of my friends from the class and I rented a theater in Culver City this afternoon and hopefully will be practicing as a group for the rest of the summer. On storytelling via film, I’ve spent the last two weeks learning the ins and outs of Final Cut Pro, Apple’s professional editing suite. It’s incredibly powerful (and built sort of like Microsoft Excel but for video) and I’m excited about the control that it offers above and beyond the Apple iMovie editing suite (which I used for my first couple videos). I’m just putting the finishing touches on my first movie from the roadtrip, titled Buffalo Walk. It is a 9 minute piece that tries to answer the question: “what are the values that will make people across America want to pack up their bags and move to Buffalo NY today”? Given what I’ve learned in this course, I suspect that the intended meaning of this last point is that good improv is realistic. For improv to be funny, it needs to have a grounding in reality. If it’s completely fantastical, and the characters and scenarios are simply crazy, the audience will stop caring. That said, I also interpret this in another way: the more comfortable you are with life, the more receptive the audience will be to your improv. From the two shows I’ve viewed and through my experience with my classmates, I find that the performers who consistently get the most laughs are those who truly don’t care about how they’re perceived, who are okay with complete lack of control in a scene, and who are totally focused on the moment (as opposed to the audience, or other distractions). In short, the more comfortable they are with their place in the universe (and whatever it throws at them), the more readily the audience connects with their work. My goal for the summer is to get a lot better at understanding peoples’ personal stories (ethnography), and sharing their stories – as well as my own – with others in a compelling way (performance). The first 20 days of my internship have been decidedly ethnographic. With the exception of a workshop I held for students at a community center in Springfield Missouri, my days have been spent listening, rather than talking. I felt that it was important for me to start in this order because my gut tells me that in order to tell a good story, I must first become a good listener. Over my cross-country drive, I’ve interviewed 32 people on camera, in eleven cities across America, in discussions that ranged from five minutes to two hours in length. From the electrical engineer who became a pastor in Tulsa Oklahoma, to the graphic designer who moved to Mumbai India to start a nonprofit, to the Polish refugee who built a large baking business in Chicago, most of my interviews were focused on people who took a big risk to follow a passion. 1. 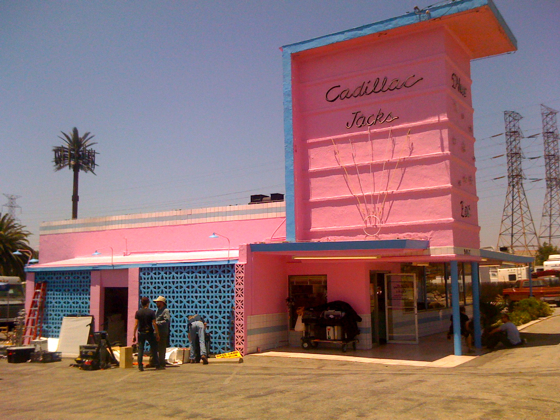 Open mics: Reciting stories at open mic venues throughout LA. 2. Improv: Creating stories on the fly and performing them in front of others. 3. Film: Telling story via short-form video. To that end, next week I start my open mic training via Fresh Faces, a standup workshop instructed by the talented Leslie Wolff. I also start a one-week intensive improv course with the Upright Citizens Brigade. Finally, I plan to hit the editing room and produce a series of short, hopefully inspirational videos using the footage I gathered over the course of my journey thus far. When it comes to writing, I’m usually a perfectionist. I pore over my words, check its cadence, and double-check its grammatical correctness. Perfectionism has its place, but it also has its price. It is this perfectionism that often stands between me and self-expression. Over the last year, there are many things that I have wanted to write about — but which I haven’t — because I didn’t have the time to craft a post that I felt that I would be happy with. My upcoming summer storytelling internship in Los Angeles is about being driven by my emotions, rather than my intellect. It’s about passion over strategy. And so with this internship, and this blog, I will experiment with a different approach. I vow to prize quantity over quality. I vow to prize content over beauty. I will make mistakes. I will stay stupid things. But in the spirit of my journey it’s about going with a feeling, putting myself out there, and seeing what happens. I hope you’ll join me as I embark on a cross-country journey to Los Angeles to try my hand at storytelling. I’ve included my original blog post – below — which describes the journey that’s gotten me here. Now it’s about making it real. Three judges from Xerox, Cisco, and HubSpot. Eight contestants from MIT Sloan and Harvard Business School. And a surprise appearance by one John Coleman. A big thanks to all those who helped to bring this week’s Bold Sell Competition to life, including our volunteers, judges, contestants, and the over 200 people who attended the event. Congrats also to our three winners: Slava Menn (MIT – 3rd place); Chika Ekeji (MIT – 2nd place); and William Collis (Harvard – 1st place). If you’d like to play an active role in organizing next year’s competition, or would like to bring The Bold Sell to your school or organization, do let us know. For video of all our winners, click here. A big thanks to all those who brought this week’s Bold Sell Competition to life, including our volunteers, judges, contestants, and the over 200 people who attended the event. Congrats also to our three winners: Slava Menn (MIT – 3rd place); Chika Ekeji (MIT – 2nd place); and William Collis (Harvard – 1st place). Without further ado, presenting video of the top three winners of The Bold Sell competition. In last Fall’s Basic Sales Training Workshop, renowned sales guru Jeff Hoffman described sales as based on the principle of “creating a sense of urgency where none exists.” That urgency, Jeff stated, is created by the seller and instilled in the buyer. Fair enough. As kids, however, we learned another important principle: “If you can’t take it, don’t dish it out.” And so, on March 3rd, we put our finest orators on call and create for them an urgent condition. Cue the Bold Sell Competition. In a first-ever collaboration between the MIT Sloan Sales Club and the Harvard Business School Public Speaking Club, our two schools join forces to test – and celebrate – our most creative, witty, and captivating MBAs. The premise is simple: 1 product, 6 slides, 7 minutes, and an eager audience packing Wong Auditorium. Your challenge? Sell a product like it’s the next coming of sliced bread. The catch? You don’t know what product you’re selling, nor do you know what’s on your slides, until you’re standing in front of your audience. And one more thing: your performance will be scored by sales execs from Cisco, AOL, Xerox, and Hubspot. Go. 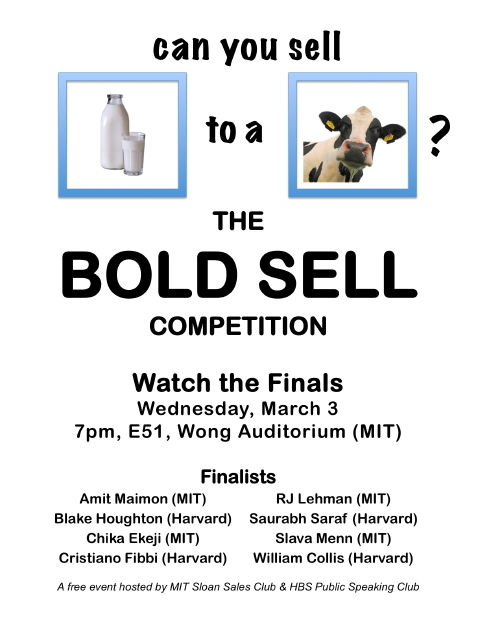 The Bold Sell Competition will be held on Wednesday March 3rd at 7pm in MIT Sloan’s Wong Auditorium. Our goal is to laugh, listen, and celebrate those brave enough to step into the spotlight, so bring your friends and join us to cheer on our fellow MBAs (Admission is free). Here’s to laughter, creativity, community, and sales. See you in Wong.